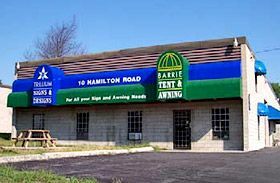 Barrie Tent & Awning would love to hear from you! To request a free, no-obligation estimate for our many products and services, please feel free to give us a call, send us an email or pay us a visit if you’re in the Barrie area. You may also fill out the form found below at your convenience. One of our friendly, knowledgeable staff members will return your inquiry as quickly as possible, as we sincerely appreciate your interest in our company.